Everyone loves aquariums. What’s not to love? Fluttering fishes, lush green back drop and ambient lights- you could keep watching it for hours. But here’s the thing about aquariums, they demand a lot of care and maintenance. And if you can’t comply, then don’t even bother getting a massive tank. That said, small tanks are perfect for people who are new to the game. They are great for kids, great practice for beginners and almost no work to maintain. 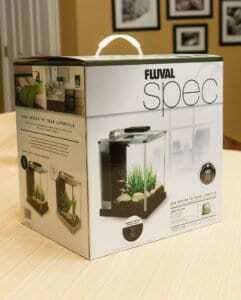 Take the Fluval Spec III Aquarium Kit for example. We heard some great stuff about it for sure, but those were nothing but word of the mouth. 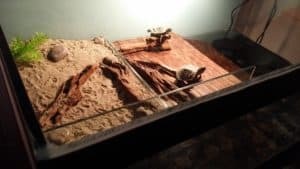 If you want a firsthand user experience and review then stay with us and keep reading our take on the Fluval Spec III Aquarium Kit! 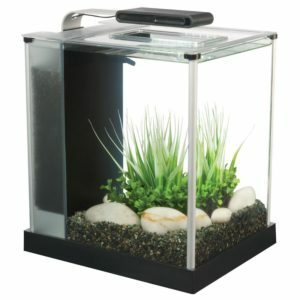 Before we go further discussing the ins and outs of Fluval Spec III Kit, please keep in mind that this tank can accommodate a single betta fish only. May be a school of small tetras, not more than 5-6 in number. Another option is dwarf shrimps. This can be a perfect breeding ground of colorful shrimps. So ideally you can call it a betta tank or shrimp tank! We have even listed it in our reviews of Best Betta Fish Tanks. 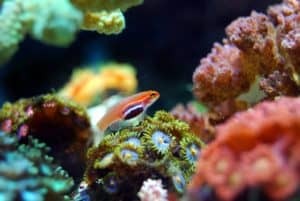 The very first thing you will notice about the Fluval Spec III Aquarium is that it is small. Now, now. We don’t want you to think that it is petite or fish bowl kind of small or anything. It just isn’t as massive as you’d expect an aquarium this beautiful to be. 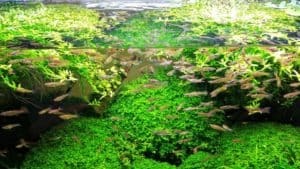 Which is a plus for everyone who is looking for an affordable and low maintenance fish keeping experience. The Fluval Spec III Aquarium measures 10.8 x 8.7 x 11.8 inches in dimensions and weighs just a tad bit above 10 pounds. And the fish tank is square, offers a capacity of 2.6 gallons. The tank is made out of etched glass which sits inside a tabletop framework with aluminum trims. One thing we really like is that the filter is not visible. It sits beside the tank but in a frosted compartment. This makes the whole setup so much more visually appealing. There is also an LED light shining above the hood. Perfect for your bedrooms or small offices. The fantastic thing about this the Fluve Spec III is that, despite being a low gallon-er, it does not skimp away from performance. This kit comes with a kickass 3-stage oversized mechanical, chemical and biological filtration system. This clean and sifts the water like a pro, and also makes sure that you don’t have to clean the tank as frequently. The kit furthermore uses foam block, activated carbon and BioMax bio ring for a better performance! Speaking of which, there have been a handful of complaints regarding the filtration performance. Many users complain that it skims the top surface of the water and end up creating too much current. Hmmm … . Right above the hood stand the LED lights of the Fluval Spec III Aquarium. 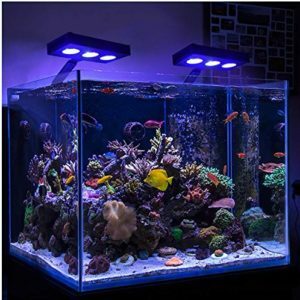 This kit uses a powerful 31 LED lighting system which provide ample amount of both light and heat into the water to sustain your aquatic ecosystem. Having said that, the light is of questionable quality. It doesn’t seem to last for more than 6 months for most users, if not less! Would you reckon the LED lighting on this kit is strong enough to sustain live aquatic plants? Answer: I don’t see why you can’t do it. It will feed you live plants just fine. 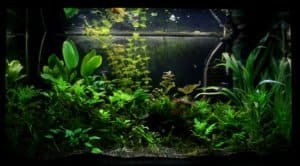 Having said that, some plant need more light than others and the LED lighting on the Fluval Spec III Aquarium Kit would be ideal for low lights plants only. Plants like java moss and java fern, for instance. For carpeting or other high demanding plants you need better LED lights for aquarium plants. Answer: Well, the first thing you need to know is that, goldfishes, out of the other aquarium fishes poop like a machine gun. And for a single gold fish the tank requirement is minimum 20 gallons. So the question ends right here, you can’t keep gold fish in this aquarium. For the cleaning part, it depends on the bio-load and livestock you keep in this tank. Follow the regular water change schedule of 30%-40% every week and clean the filter with tank water every month. You are good to go! Would you say the hood on this aquarium is cat and kid proof? Answer: We think so, yes. But not completely immune to them, though. The hood fits flush with the fish tank. And there’s a small elongated opening on it above which you have the LED light shining through. So if you cat, or kid, were to open the lid, they’d need to remove the light out of their way first. Not impossible, but definitely more work. Dimensions of the fish tank, only, please? Answer: The fish tank, without the filter and all, measures 8 inches in length, 8 inches in width and 10 inches in height. Does the LED light come with a timer? Answer: No, but you can certainly get one separately. There are heaps available for cheap and they will work with the lighting system of the Fluval Spec III Aquarium kit. And that was our complete and honest review of the Fluval Spec III Aquarium Kit. We, personally, like the kit. But it is far, far from being a nearly qualified starter kit for most people. Its faulty and moody filtration and pump system is bound to make users hot. On the plus side, if you have low expectations, this just may make the cut. Great for kids who want to learn and have some fun. Not so much for people who know what they are doing, though. A toy aquarium, if you will. 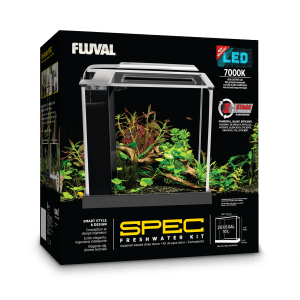 There are some other aquarium starter kits by Fluval which you may find interesting, like the Fluval Flex 57 Nano Aquarium Kit. And with that, it’s a wrap. We hope you found out everything you were looking for about the Fluval Spec III Aquarium Kit. Thank you so much for staying with us and we will see you next time very soon. Adios!